The WHO European Office for Integrated Health Care Services in Barcelona is an integral part of the World Health Organizations' Regional Office for Europe. The main purpose of the Barcelona office is within the integration of services to encourage and facilitate changes in health care services in order to promote health and improve management and patient satisfaction by working for quality, accessibility, cost-effectiveness and participation. This position paper outlines the need for Integrated Care from a European perspective, provides a theoretical framework for the meaning of Integrated Care and its strategies and summarizes the programmes of the office that will support countries in the WHO European Region to improve health services. The integration of health and social services is a challenge to many health systems in Europe and throughout the world. Newspapers almost daily shed bad light on health and social services, nourished by reports on medical errors, waiting times, insufficient access, high costs and poor quality. The common denominator of many complaints is that they are mostly related to weaknesses in the health system but to an individual's fault. In view of that, the attention of many health service researchers, administrators and policy makers is changing to focus on the interplay of the different parts of the health system—functions, institutions, and professions—in order to improve the performance of the health system. The World Health Organization has acknowledged the importance of this view in the World Health Report 2000 “Health Systems: Improving Performance” . Defining a health system as to include all activities whose primary purpose is to promote, restore or maintain health, the main message of the report is that health and well being of people depends critically on the performance of the health system. This message has received widespread sympathy, although the report also initiated a vivid debate on the methodology used to collect data and rate health system performance. The performance of health systems will continue to be in the focus of WHO and will be covered again in the World Health Report 2002 . As a main part of health systems, health services make a significant contribution to population health and the quality-of-life of people . Their existence gives a feeling of security and provides workplaces for large parts of the population. There are, however, also many problems related to health services: They consume large proportions of the health system resources, which are frequently concentrated in large hospitals offering deficient access to its users. In addition, in many European Countries the integration of primary, secondary and tertiary care is weak, resulting in poor quality and inefficiency, and often causing unnecessary inconvenience to patients. People in the Region should have much better access to family-and community-oriented primary health care, supported by a flexible and responsive hospital system. Countries should have health services that ensure individuals' participation and recognizes and supports people as producers of health care. As an integral part of the WHO Regional Office for Europe, the WHO European Office for Integrated Health Care Services deals specifically with the issue Integrated Care. It aims to identify strategies used in health care services in different countries to facilitate and encourage the coordination between levels of care and improve outcomes . The main areas of work of the office, which is based in Barcelona and supported by the Regional Government of Catalonia, are: Linking Levels of Care, Primary Health Care, Hospital Management, Emergency Services, Health Promoting Hospitals, Home Health Care, Human ResourceDevelopment, and Telemedicine. All projects have an important component of coordinating and integrating health care services, being in themselves closely linked together and supplementing each other. Before the projects of the WHO European Office for Integrated Health Care Services are introduced in more detail in Chapter 4, it is necessary to review the driving forces for health services integration, the strategies applied in European Countries and to clarify conceptual issues related to Integrated Care. 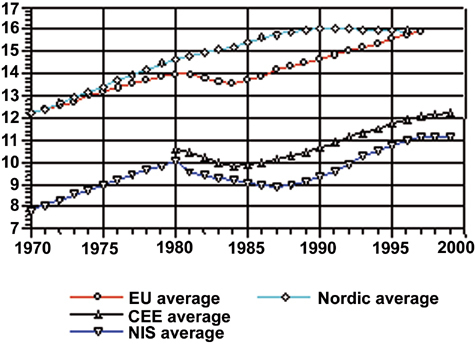 In the WHO European Region the percentage of the population aged 65 years and older is rising (Figure 2); a trend which is likely to continue . This demographic trend is posing challenges to health systems since the need for health and social services typically increases at retirement age, and accelerates over the age of 75 years [7, 8]. 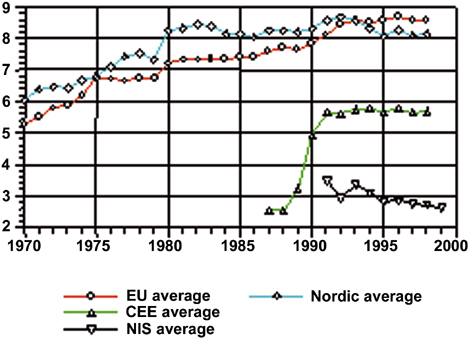 Although in the Central and Eastern European (CEE) countries and Newly Independent States (NIS) proportions are still significantly lower as compared to the European Union average, their demographic patterns are now clearly following the trends of Western European Countries. In combination with the emigration of the young and declining fertility rates in southern, central and eastern European countries (where fertility rates traditionally were high) the growing population of older people pose not only challenges to the supply of services, but also to their financing. The actual demand resulting from the demographic transition, however, is difficult to extrapolate. While some argue that expansion of life expectancy may translate into expansion of morbidity it is also conceivable that more healthy lifestyles, more effective care, innovative medical technologies and genetic research may allow the compression of morbidity [10–12] . Irrespective of the scale of demand, the scope of demand is likely to be characterized by the presentation of multiple disorders with functional, psychological and social dimensions which can be better dealt with by integrated forms of health and social service provision . Ageing of the population is another reform-pressure due to the changing pattern of morbidity. Chronic diseases such as ischaemic heart disease, cerebrovascular disease, mental illness, diabetes mellitus and cancer are large contributors to the burden of disease . 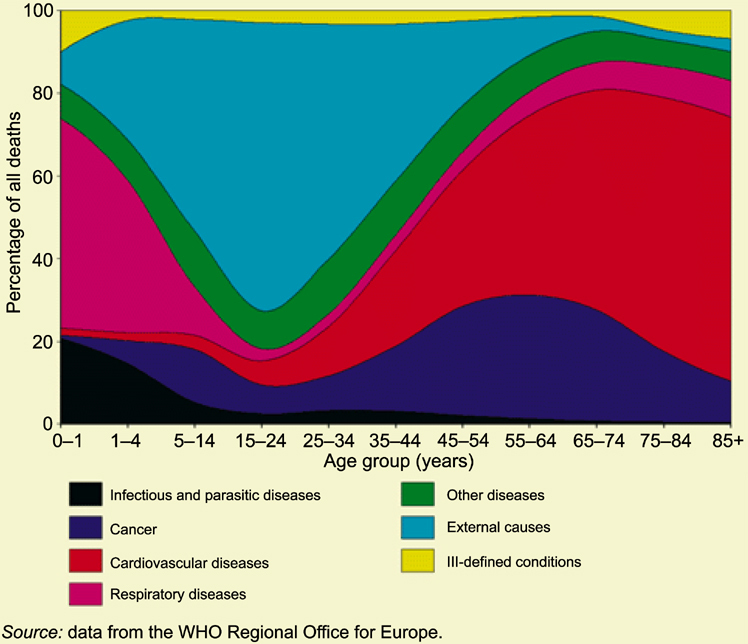 Although in adolescence external causes are the main cause of death, in later years of life cardiovascular diseases account for the largest proportion of causes of death in the European Region (Figure 3). It is important to note that chronic conditions require much more complex forms of treatment than can currently be provided in acute hospitals alone [16–18]. In terms of achieving cost-effective treatment of chronic conditions health care institutions will also need to engage more in providing primary, secondary and tertiary prevention [19, 20]. In addition to demographic and epidemiological trends, individual expectations of patients are the third major demand-side factor questioning the current organization of care. Patients are becoming better informed through the Internet and other sources, and are more confident and emancipated, acknowledging their rights and demanding better services . In order to meet patients' expectations, access to and continuity of services has to be improved with health services taking over more responsibility in providing better management, health promotion services and comprehensive rehabilitation [23, 23]. The developments in health telematics (information and communication technologies) and medical technologies have a major impact on the primary health care and hospital system and offer new opportunities for integrating departments, institutions and improving access to services for patients in more remote areas. In a fragmented health system patients are often transferred to other departments or institutions without complete information about the patient's condition, medical history, services provided in other settings, or medications prescribed by other clinicians. This brings along risks, waiting times and delays for the patient and duplication of tests causing additional costs to the health care system. At micro level, information and communication technologies support the empowerment of citizens, they allow better-informed patients and carers and have the potential to improve the quality of clinical care by facilitating the provision of feedback to individual health professionals on the outcomes of care they deliver [24–26]. At meso level they help to integrate multi-professional teams and institutions; at macro level information technologies allow better planning of services based on epidemiological investigations and outcomes . Information technologies reduce the cost of information and diminish barriers to inquire, thereby sustaining the evidence-based medicine movement. Although some technical issues remain to be solved, such as confidentiality of electronic patient records, financing and quality of services, information systems will continue to be a driving force for the development and integration of health care systems [28–30]. Telemedicine, as the system that allows the diagnosis and treatment of patients at local level in real time without the need to refer patients to specialized institutions, improving access in particular in areas where specialized services are not easily available, and as a long-distance training tool for health care professionals, is another example of a tool that will facilitate the coordination of services [31, 32]. Hence, telemedicine is a useful tool to overcome the inverse care law . New medical technologies will continue to have a major impact on the whole of the provision of health services. Changes in treatment procedures, minimal invasive surgery reducing length of stay, sensors innovating laboratory work, devices monitoring patients at home and portable complex equipment, all require new forms of health service provision . Xenotransplantation and genetic therapies, too, may require changes in the settings where care is provided. All of that enforces the need of coordination between ambulatory care and high specialty clinics. Telemedicine may be in the near future the trigger of health care systems restructuring. The actual impact of medical technologies for diagnosis and treatment on the health care system, however, is difficult to predict. New surgical techniques, imaging technologies and pharmaceuticals may be more cost-effective than existing ones, potentially prevent admission and facilitate linking services. Nevertheless, often they do not substitute existing technologies, but rather induce new demand. By diminishing the average length of stay these technologies allow new admissions resulting in an overall increase in health care expenditure (Figure 4). Hospitals typically consume between 40 and 80% of the total health care expenditure . Accordingly, most health care reforms focused on issues of cost containment in this sector alone and emphasized market forces to achieve this end. Though most health systems were able to contain costs in the last decade the total health expenditure per capita has increased steadily (Figures 5 and 6). It is questionable whether cost-containment will be achievable in the future by the same means, given bed capacity of hospitals has been diminished and hospitals as single organizations have been to a large extent reengineered. At the same time, shorter diagnostic and treatment procedures decrease length of stay; they increase access capacity and allow a higher number of more expensive interventions in the same amount of time. After substantially reducing number of beds and staff in hospitals, more efficiency (and quality) may be achieved by taking a different health-system perspective and improving the linkages between different levels of care. The recent report of the US National Institute of Medicine “Crossing the Quality Chasm: A new Health System for the 21st Century”  affirms that it is no longer possible to provide better services only on the basis of improving skills, clinical procedures and high-technology alone. In order to achieve a safe, effective, patient-centred, timely, efficient, and equitable health system the consolidation and harmonization of its parts will yield much better benefits. Every organized human activity—from the making of pots to placing man on the moon—gives rise to two fundamental and opposing requirements: the division of labour into various tasks to be performed, and the coordination of these tasks to accomplish the activity. The structure of an organization can be defined simply as the sum total of the ways in which it divides labour into distinct tasks and then achieves coordination among them . Transferring this to the way health systems are organized it may be concluded that much work has been carried out regarding the division of labour, however, the coordination and integration of the parts of the health systems has been neglected. There is a lot that can be learned from the industrial sector, from technological developments and from international comparisons. Payment mechanisms, referral systems, guideline and professional education are major means to guide structures and processes in the health system in order to achieve high quality outcomes. Payment mechanisms have a strong influence on the behaviour of health professionals. They give incentives to increase or decrease the number of patients (capitation), the number of visits (salary or fee-for-service), the type of diagnostic and treatment procedures selected (fee for services), and the referral or not of patients to other institutions and levels of care (salary, fee-for-service) [38–40]. All existing mechanisms to pay health personnel have their advantages and disadvantages. To foster the provision of some form of treatment while providing other services in a more restrictive way different payment mechanisms can be combined (e.g. basic salary plus fee-for-services for preventive and health promotion services). Gatekeeper-systems are an effective means for the coordination of services, not because they restrict access but because they guide the patients to the most appropriate providers serving as the entry point to the health care system. As the experiences from the Netherlands show such a system prevents unnecessary admissions and visits to specialists and guarantees the provision of care at the lowest possible level. Well-organized referral systems provide feedback between the different levels of care involved in the provision of services for a patient in order to ensure appropriate follow-up and continuity of care . In order to improve the cooperation of services guidelines and protocols are frequently applied. They can support the alignment of services and adjust diagnostic procedures, treatment and medication plans between the institutions involved in providing services for the patient. Experience shows that they have to be consensually developed between the different actors in the systems if they are to be respected and applied. Nevertheless, further work is needed to investigate how guidelines can be more effective in guiding health care professional's behaviour. In order to improve the link between different levels of care guidelines have to be considered in the context of financing of services and payment mechanisms as these elements influence each other. Human resources are an important factor in all health services. They account for more than half of the health care systems expenditure. Some 1.5 million physicians, over 4.5 million nurses and millions of other health care workers contribute to the provision of health services in the Region . However, while in some countries certain areas are overstaffed in other areas there is a considerable shortage of health professionals. In addition, the workload for many health professionals is very high and under these conditions job satisfaction is low. Education of health professionals and new organizational arrangements in the provision of services are important in filling the gap of workers required and to increase job satisfaction . Education plays also a major role in preparing health professionals in the use of modern telematics and to keep their knowledge “state-of-the-art” in a changing environment. More work is necessary to examine the impact of payment mechanisms, referral systems, guidelines, protocols and education and their overall effect on the performance of health systems. In order to improve quality, access and efficiency the parts of the health system need better consolidation and harmonization, which requires a combination of technological and managerial strategies. In response to both the change in demand for health services and the possibilities of its supply the healthcare landscape has changed considerably in the last decades. 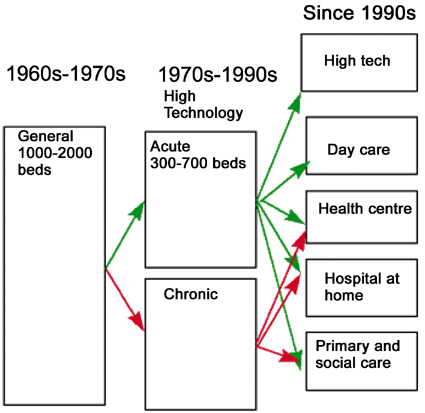 Were health systems in the 1960s and 1970s strongly dominated by large general hospitals, the most apparent trend in the period 1970s–1990s was the sizeable reduction of hospital beds and the sub-specialization of hospitals. Since then, a number of services are grouping around acute hospitals: day care facilities, ambulant clinics, health centres, nursing homes, and residencies (Figure 7). The changes in supply, in particular medical technologies and information systems, allow for the substitution of services. Substitution policies can be differentiated according to a change in the location at which care is given, a change in the technology, which is used, and a change in staffing and skills required . Numerous possibilities to substitute services exist, allowing treatment closer to the patient, preventing admission and using more efficient staffing. As a result, the hospital system is becoming more complex, requiring better coordination and integration of services. Many countries in the WHO European Region introduced mechanisms to achieve better integration of the hospital system. The approaches lack a common terminology and are labelled with different terms, such as “shared care”, “transmural care”, “intermediate care”, “seamless care”, “disease management”, “case management”, “continuous care”, “integrated care pathways” and “integrated delivery networks”. Although all strategies have in common the aim to improve coordination and integration of services, their scope is quite different. Some strategies consider to overcome professional and departmental boundaries and aim towards the development of multi-professional teams while others aim to integrate different sectors of care, namely to link primary, secondary and tertiary care. Whereas the former strategies, linking services on the same level, are often referred to as horizontal integration, the bringing together of services operating at different levels is typically denoted as vertical integration [44, 45]. In addition to the type of integration strategies improving the links between services also show widely varying goals: Some strategies are mainly implemented to reduce costs, while others additionally focus on quality, access, and user satisfaction. Integrated Care is a concept bringing together inputs, delivery, management and organization of services related to diagnosis, treatment, care, rehabilitation and health promotion. Integration is a means to improve the services in relation to access, quality, user satisfaction and efficiency . The role of the WHO Barcelona office is to identify approaches that promote and facilitate evidence-based decision-making in the development of strategies for health care services, and operationalise findings to facilitate the improvement of health care services within its Member States. Its main task is to help Member States with the new challenges the European context poses today to health care systems, calling inter alia for improved effectiveness and efficiency, better quality and stronger citizen's participation. the impact of Internet in-patient and professional behaviour to empower patients and to train professionals. Since the health systems in the Central and Eastern European Countries and Newly Independent States are marked by the same demographic and epidemiological trends as the western countries, and an identity within the WHO European Region is developing it is likely that the organization of their health systems will converge with those of Western European Countries . Meaningful international comparisons and the sharing of existing knowledge can support the transitional period and be of use to Western countries, too. advise and provide support to governments on health care delivery systems. The main areas of its work are Primary Health Care; Hospital Management (information and reimbursement systems); Emergency Medical Services; Health Promoting Hospitals; Home Health Care; Financing Health Care Services; Developing Family Medicine, the Family Physician and Family Nurse; Medical Education; Towards Unity for Health; and Training Health Care Systems Managers. Two programmes will go across all the other projects: Linking Levels of Care and Telemedicine, focussing on those strategies and systems to facilitate integration. Financing health care services: Identify and promote evidence and case-studies on financing options of the health system in support of health gain, efficiency and equity; assist Member States on health services financing strategies. Linking levels of care: Analyse strategies to improve the coordination between home care, primary health care and hospital care; analyse information and referral systems and impact of patient records; levels of care and equity in access. The main strategies will be the collection of information (development of databases), the evaluation of results and development of guidelines (create experts' working groups) and the facilitation of exchange of information and experiences (networks and communication systems). This work will be carried out with many European organizations, institutes and WHO Collaborating Centres. The WHO European Region extends beyond the geographical area sketched by the European Union and embraces the Central and Eastern European Countries and Newly Independent States (see list of WHO member states: http://www.who.int/aboutwho/en/member.htm). For countries of the Organization for Economic Cooperation and Development this amounts to 40–60%, in countries of the former Soviet Union this may amount up to over 80%. While the phases as outlined below are valid for most Western European Countries, the hospital system in the Central and Eastern European Countries and Newly Independent States, though converging, is still dominated by large, centralized hospitals. The definition of Coddington et al. serves as a Medical Subject Heading (MeSH) for Medline searches. Although other sectors such as the environment, biology, and lifestyles in general have an important impact on protecting, improving and sustaining the health of people, these issues are out of the scope of the Barcelona office and are dealt with in the respective offices at WHO EURO and Headquarters ( http://www.who.dk; http://www.who.int). World Health Organization. World Health Report: Health Systems – Improving Performance. Geneva: WHO; 2000. Brundtland GH. Statement by the Director-General to the Executive Board at its 107th session 15th January 2001; Geneva EB.. 107/2 2001. McKee K. Health status in the European Union and the central and eastern European.In: Garcia-Barbero M, editor. Appraisal of Investments in Health Infrastructure. Proceedings of the European Investment Bank (EIB) and World Health Organisation (WHO) Conference on the Appraisal of Investments in Health. Barcelona: World Health Organization. European Office for Integrated Health Care Services; 2001. World Health Organization. Health 21 – The Health for All Policy Framework for the WHO European Region. European Health for All Series No. 6. Copenhagen: WHO EURO; 1999.
WHO. European Office for Integrated Health Care Services Barcelona, Spain.. Available from: http://www.es.euro.who.int. United Nations. World population prospects 1950–2025. New York: United Nations; 1992. Figueras J, Saltman RB, editors. European Health Care Reform. Analysis of current Strategies. Copenhagen: WHO EURO; 1997. Saltman RB, Figueras J, Sakellarides C, editors. Critical Challenges for Health Care Reform in Europe. Buckingham, Philadelphia: Open University Press; 1998.
WHO Health for All Statistical Database. Copenhagen: WHO EURO; 2001. Available from: http://www.who.dk. Olshansky SJ, Rudberg MA, Carnes BA, Cassel CK, Brody IA. Trading off longer life for worseing health: the expansion of morbidity thesis. Journal of Ageing and Health 1991; 3:194-216. Guralnik JM. Prospects for the compression of morbidity: the challenge posed by increasing disability the years prior to death. Journal of Ageing and Health 1991; 3:138-54. Fries JF. Aging natural, death and the compression of morbidity.In: Somers AR, Fabian DR, editors. The geriatric imperative. An introduction to gerontology and clinical geriatrics. New York: Appleton-Century-Crofts; 1981. p. 105-16. Bennet G, Ebrahim S. The essentials of health care of the elderly. London: Edward Arnold; 1992. Murray CJL, Lopez AD. The global burden of disease: a comprehensive assessment of mortality and disability from disease, injuries and risk factors in 1990 and Projected to 2020. (Global Burden of Disease and Injury Series, Vol. 1). Boston, MA: Harvard University Press; 1996. World Health Organization. Report on the third evaluation of progress towards health for all in the European Region of WHO (1996–1997). Copenhagen: WHO EURO; 1998. World Health Organization Regional Office for Europe: HEALTH IN EUROPE 1997. (Regional Publications European Series, No. 83). Strauss A, Corbin JM. Shaping a new health care system: the explosion of chronic disease as a catalyst for change. San Francisco: Jossey Bass; 1988. Wagner EH, Austin BT, Von Korff M. Organizing care for patients with chronic illness. Milbank Quarterly 1996; 74(4):511-44. Badura B, Feuerstein G. Systemgestaltung im Gesundheitswesen. Zur Versorgungskrise der hochtechnisierten Medizin und den Möglichkeiten ihrer Bewältigung. Weinheim, München: Juventa; 1994. Doherty D. Challenges for hospital policy in Europe: what role can health promotion play?.In: Pelikan JM, Krajic K, Lobnig H, editors. Feasibility, effectiveness, quality and sustainability of Health Promoting Hospital Projects. Gamburg: G. Conrad; 1998. p. 36-41. Garcia-Barbero M. The health promoting hospitals movement. The Journal of European Private Hospitals 1994(4):33-6.
WHO. Journal of European Private Hospitals: Citizens “Choice and Patients” Rights. Copenhagen: WHO EURO; 1996. Hogg C. Patients, power and politics. From patients to citizens. London: King's Fund; 1999. Wilde MI. Patient-centered healthcare. London: King's Fund; 2000. O'Connor AM, Rostom A, Fiset V, Tetroe J, Entwistle V, Llewellyn-Thomas H, et al. Decision aids for patients facing health treatment or screening decisions: systematic review. British Medical Journal 1999 Sep 18; 319(7212):731-4. Bates DW. Using information technology to reduce rates of medication errors in hospitals. British Medical Journal 2000; 320(7237):788-91. Detmer D. Information technology for quality health care: a summary of United Kingdom and United States experiences. Quality in Health Care 2000; 9:181-9. Hunt DL, Haynes RB, Hanna SE. Effects of computer-based clinical decision support systems on physician performance and patient outcomes: a systematic review. Journal of the American Medical Association 1998; 280:1339-46. Chadwick DW, Crook PJ, Young AJ, McDowell DM, Dornan TL, New JP. Using the Internet to access confidential patient records: a case study. British Medical Journal 2000; 321(7261):612-4. Hertzberg J. Computerized patient records: current and future opportunities. J Med Pract Manage 2000; 15(5):250-5. Institute of Medicine. The Computer-Based Patient Record: An Essential Technology for Health Care. Washington: National Academy Press; 1997. World Health Organization. A health telematics policy. Report of a WHO group consultation (WHO 7DGO/98.1). Geneva: WHO; 1998. Halvorsen PA, Kristiansen IS. Radiology services for remote communities: cost minimisation study of telemedicine. British Medical Journal 1996; 312(7042):1333-6. Hart JT. The inverse care law. Lancet 1971; i(7696):405-12. Wilson CB. The impact of medical technologies on the future of hospitals. British Medical Journal 1999; 319:1287-91. Edwards N, Harrison A. The hospital of the future: planning hospitals with limited evidence: a research and policy problem. British Medical Journal 1999; 319:1361-3. National Institute of Medicine. Crossing the quality chasm: a new health system for the 21st century. Washington: National Academy Press; 2001. Mintzberg H. The structure of organizations. Englewood Cliffs, N.J.: Prentice-Hall; 1971. Gosden T, Pedersen L, Torgersen D. How should we pay doctors? A systematic review of salary payments and their effect on doctor behaviour. Quarterly Journal of Medicine 1999; 92(1):47. Rosen B. Professional reimbursement and professional behavior: emerging issues and research challenges. Social Science and Medicine 1989; 29(3):455-62. Gosden T, Forland F, Kristiansen IS, Sutton M, Leese B, Giuffrida A, et al. Capitation, salary, fee-for-service and mixed systems of payment: effects on the behaviour of primary care physicians. The Cochrane Database of Systematic Reviews 2000(3):CD002215. Grimshaw JM, Winkens RAG, Shirran L, van der Weijden T, Grol RPTM, Pop P. Interventions to improve physician referrals from primary to secondary care. The Cochrane Database of Systematic Reviews 2000(4). Zwarenstein M, Bryant W. Interventions to promote collaboration between nurses and doctors. The Cochrane Database of Systematic Reviews 2000(2):CD000072. Warner M. Implementing health care reforms through substitution. Cardiff: Welsh Institute for Health and Social Care; 1996. Conrad DA, Dowling WL. Vertical integration in health services: theory and managerial implications. Health Care Management Review 1990; 15(4):9-22. Brown M, McCool BP. Vertical integration: exploration of a popular strategic concept. Health Care Management Review 1986; 11(4):7-19. Marriam Co, C & G. Webster's Revised Unabridged Dictionary, accessed through ftp://ftp.uga.edu/pub/misc/webster/. NJ. : MICRA, Inc. of Plainfield; 1998. Devers KJ, Shortell SM, Gillies RR, Anderson DA, Mitchell JB, Erickson KM. Implementing organized delivery systems: an integration scorecard. Health Care Management Review 2001; 19(3):7-20. Coddington DC, Moore KD, Fischer EA. Integrated health care: reorganizing the physician, hospital and health plan relationship. 2. Englewood, Colorado: Center for Research in Ambulatory Health Care Administration; 1995. World Health Organization. Integration of health care delivery. Report of a WHO Study Group. WHO Technical Report Series. 861. Geneva: WHO; 1996. World Health Organization. Strategies for integrating primary health services at the point of delivery. Extended protocol in preparation for a cochrane systematic review. Draft. Geneva: WHO; 2000.
WHO European Office for Integrated Health Care Services. Integrated Care. Working Definition; 2001. Anderson GF. In search of value: an international comparison of costs, access, and outcomes. Health Affairs 1997; 16:163-71. McKee M, Figueras J. Comparing health care systems: how do we know if we can learn from others?. Journal of Health Service Research and Policy 1997; 2(2):122-5. Torgerson DJ, Maynard AK, Gosden T. International comparisons of health-care expenditure: a dismal science?. Quarterly Journal of Medicine 1998; 91:69-70. 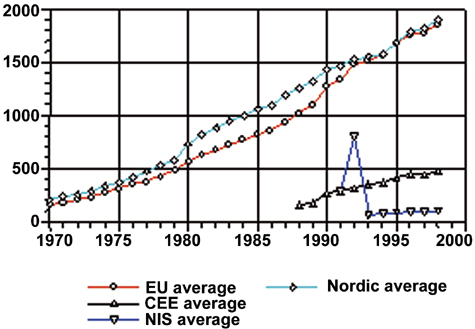 Cucic S. European Union health policy and its implications for national convergence. International Journal for Quality in Health Care 2000; 12(3):217-25. Driving forces for Health Care Reform. Percentage of population over 65 . Main causes of death in the European Region . EU average ALOS and admission rates per 100 population . Total health expenditure as percent of gross domestic product . Total health expenditure in purchasing power parity per capita .